We have been introducing Evangeline to food for the last 3 months and have had major successes and failures in the process. If you’re a parent or parent-to-be then I’m sure you are aware of how expensive shopping can be for babies. It’s important to know that when it comes to weaning you really don’t have to spend excessive amounts to get the essentials. 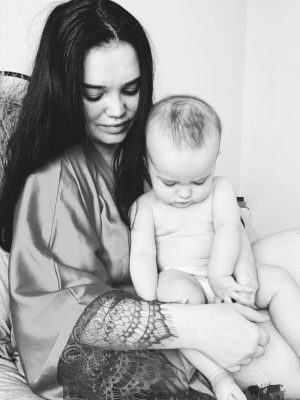 As Eve is our first baby it’s been a matter of trial and error and I wanted to share what has worked well for us. I’m no expert, just a Mum sharing from my own personal experiences. The baby food aisle in your supermarket can feel very overwhelming, especially when all you’ve thought about is milk for the past few months! I hope this can help some parents who may need some guidance with where to begin with weaning, like every step of parenthood we are still learning every day. I can assure you that at first Paul and I didn’t have a clue but now we’ve found a feeding routine that works for us all and Evangeline is throughly enjoying herself in the process! Aldi has been one of our favourite shops for Evangeline’s essentials, if you’ve not taken advantage of one of their Baby Events then it’s definitely something to look out for! 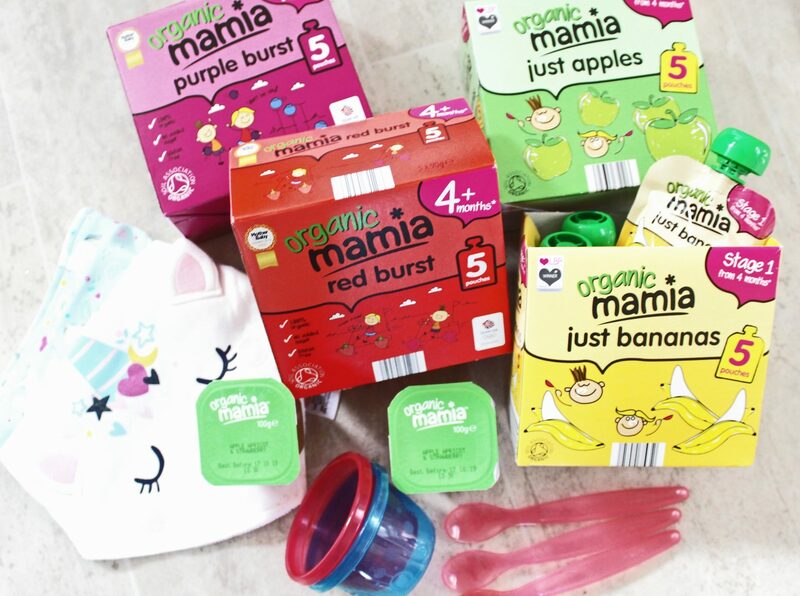 Ever since Eve’s arrival we have used the Mamia range of nappies, wipes and nappy bags. You cannot fault the quality and price of the items and they were recommended to us by so many other parents! 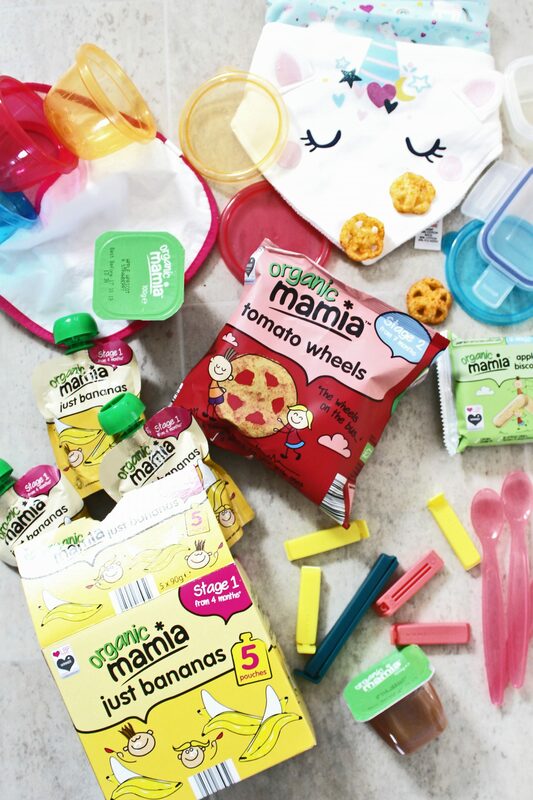 When it came to introducing Eve to weaning we thought why not try their range of baby food and snacks too? Whenever we are in our local store to do a good stock up of essentials it’s something that we now always include. When I visited the store the other day I got everything that I needed for her for £20. This included 40 nappies, 4 packets of wipes, 30 serving pouches of food and 4 packets of different snacks/finger foods which will keep her going for the next few weeks! Although it’s recommended that you wait until your baby is 6 months old, most puree ranges start from 4 months. As all babies develop differently it’s completely down to parents choice when they think their baby could be ready for the next stage. When Evangeline got to 5 months old I got really excited, cooked loads of veg and pureed it all to store in the freezer to be well prepared. When it was time for her to taste it she absolutely hated it. It was such an anti-climax and I needed to find other options to try with her whilst she was getting used to the purees I had slaved over the stove to make. If you have the time to make and puree your own baby food that’s great but if you’re struggling like we were then there is nothing wrong with buying pre-made either! Remember that it can take 10-20 tastes before a baby likes the taste of something. One of the most important factors of the weaning process is the equipment that you use, choosing what to buy can be difficult as there is so much choice when it comes to plates, cutlery and storage for meals. With so many high end and indie brands on the market, you are definitely spoilt for choice! I love Instagram aestethic pieces as much as the next person but in all honesty, you just need something that is durable, simple to store away and easy to clean. We have tried a range of different bowls and our favourites by far are the Nuby bowls, they come in 2 different sizes and in packs of 4. They can easily be stacked inside eachother and they all come with lids to make it easy to transport food out of the house and keep it fresh. If you’re looking for something especially for taking out of the house you can buy bowls with lids and a clip in spoons, we use one from the brand Vital Baby and it was so handy to keep everything together. One of the most important pieces of equipment for weaning is cutlery. We were gifted a few different types of spoons before Evangeline was born but the best spoons we have used by far are the Tomme Tippee Essential Feeding Spoons. They come in packets of 6 and the spoons are the perfect size for little mouthfuls of food. The long handles are similar the adult cutlery making it easier for them to transition in the future. Once you’ve got the Stage 1 purees down you can start to introduce fingers foods and snacks. Baby led weaning helps to encourage your baby to feed themselves and is amazing for their hand-eye coordination skills. With Eve being 8 months old now she’s on 3 meals a day and with each meal she will usually have a bowl something pureed, some of what we are having and possibly some snacks if she is still hungry. 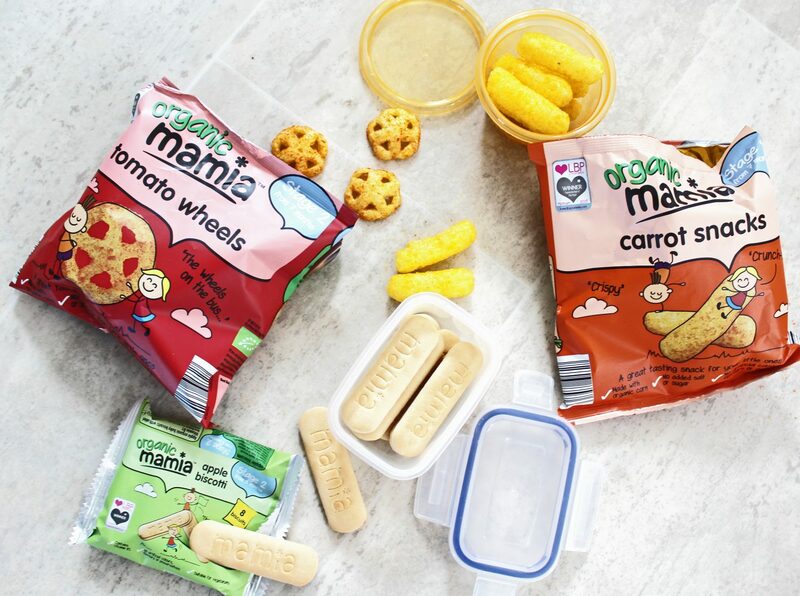 The Stage 2 Mamia snacks are great to try out and are fantastic on babies hard gums when they are teething. Evangeline has just cut her first teeth but it shocked me how she managed to crunch, chew and swallow finger foods with not much trouble at all! Evangeline’s favourite snacks have to be the Biscotti biscuits, as they are long she finds them really easy to hold onto. Finger foods can be really helpful too if you’re needing to get something done, it’s so simple to get Eve in her highchair with a snack whilst I’m attempting to sort out the house. Obviously they need to be in plain sight just in case of choking but it definitely buys you a few minutes of time. Evangeline is so nosey and loves watching me, she also loves creating more mess for me to clean when she’s done! As finger foods seem to always come in large packets this means you will have multiple servings for your little one. Once these packets are opened you need to keep in mind how they will then be contained and kept fresh. I find that clip top reusable plastic storage containers are great to store snacks in once they have been opened. 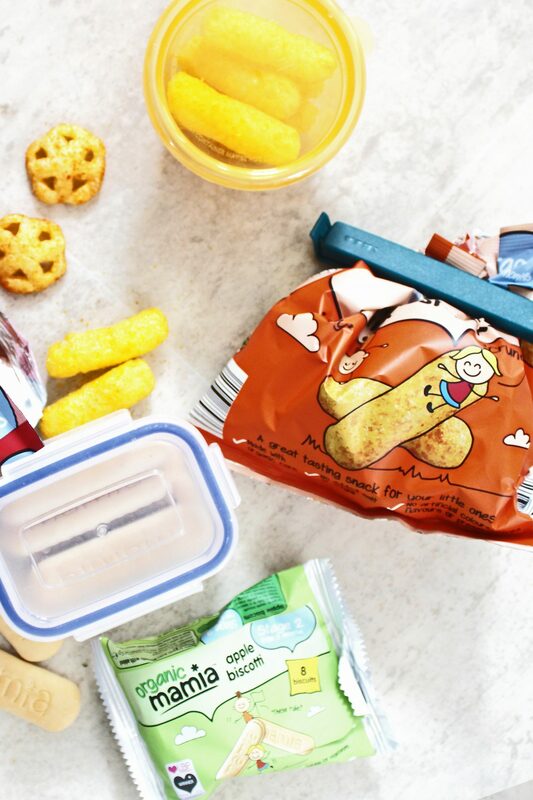 You can purchase them in all different sizes from pretty much anywhere and they are so handy for taking snacks out on the go without having to take the entire bag with you. If you have excess food in an open packet at home you can always use plastic bag sealing clips to keep them tightly sealed too, I found my pack of 30 in Ikea for literally £2.00. And that’s all of the basics covered from equipment, purees and snacks. I hope this post can help anyone that’s feeling completely overwhelmed with weaning. Please, always keep in mind that every baby is different so make sure to do everything that works at the right pace for you. With Evangeline we continue to let her try different tastes whenever she’s not something before. Paul and I both work but we try our best to have as many meals as we can with her and always give her some of what we’re eating to try whilst she’s sat in her highchair. She is very interested in food at the moment and we are finding new things every week that she likes! If you’re looking for any weaning inspiration then I couldn’t recommend Instagram or Pinterest enough! Once Eve is more confident with food I’ll definitely be trying out some recipes and doing some more home cooking for her. For the time being, we will continue with the convenience of ready-made and first tastes for her little tummy! "CRY BABY CLUB | MOST CURIOUS WEDDING FAIR | CARLA BLAIN"
Omg the unicorn bib!! Can’t take the cuteness! !